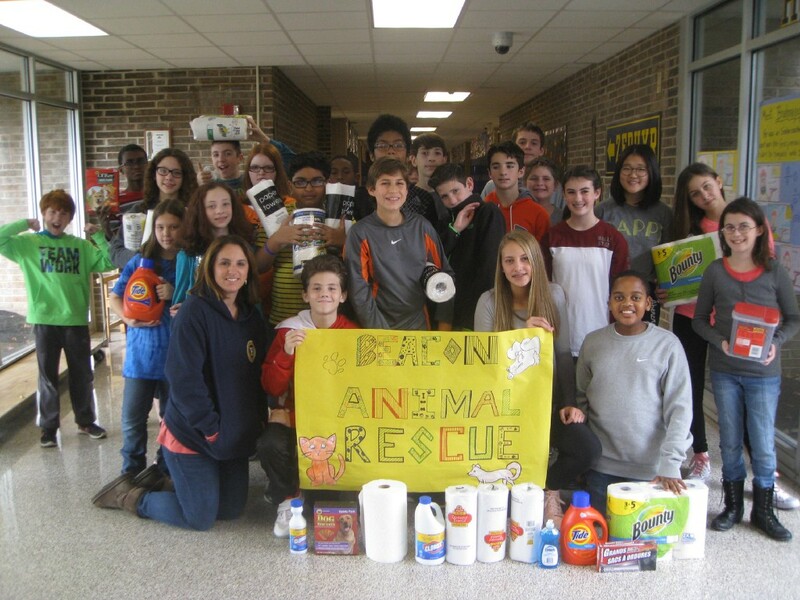 Students recently helped the Beacon Animal Rescue and Susan G. Koman Foundation. Shown with students is 7th-Grade language arts teacher Danielle Tirico. Students and staff in Zephyr House at Harrington Middle School in Mt. Laurel recently collected items on the Beacon Animal Rescue’s “wish list” and took the donations to the rescue shelter in Ocean View to help the shelter with the day-to-day expenses of finding new homes for abandoned and unwanted pets. From left students Abigail Litwin, Anna Blackburn, Luke Cole, Riley Spitznas and Ben Castner display a symbolic check. Harrington Middle School’s Zephyr House students also recently collected funds to donate to the Susan G. Koman Foundation. Zephyr House staff and students raised over $1,100 in five days during Breast Cancer Awareness Month in October.